In case you haven't heard already, I’m thrilled to let you know I’ve written a new book! Kid Chef (on sale April 5th) is a cookbook for kids who truly love to cook, supplying them on the real information they need to get comfortable in the kitchen and make meals the entire family can be proud of. 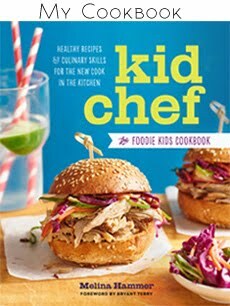 I confess I've been secretly excited that Kid Chef will equally provide a greater foundation for grownup cooks, too. 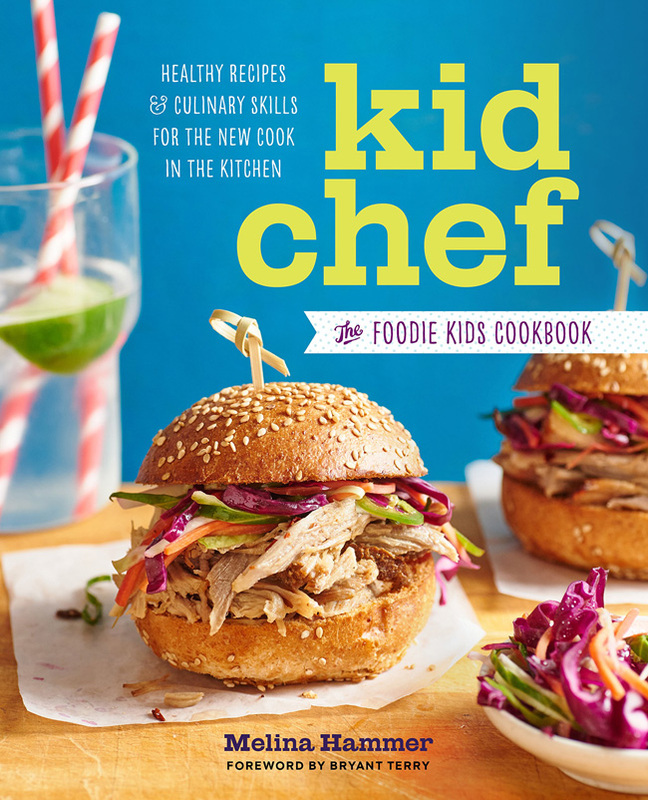 That the book is written in a no-nonsense way, and the recipes are just real, *good food* means kids and adults alike can use the fundamentals in Kid Chef. Now, we need readers and kids to take it for a test drive. My publisher Sonoma Press is giving away a limited number of digital advance review copies to see what parents and kids think! We want to get your feedback about the book in the form of an honest and thoughtful Amazon review to help online shoppers get to know the book through real readers. Sign up for yours here! Thank you as ever for your love and support. Just in time for St. Patrick's Day, here is that super savory shepherds pie I teased you with on Instagram. Enjoy! *Rotating things out of the freezer, I had a mix of both boneless and bone-in lamb neck. I diced the boneless and browned the batch with the larger chunks, and after simmering the two in the savory mixture (those lovely bones added extra body and flavor), I removed the chunks from the pot when all was ready, just long enough to cool so that I could shred the meat from the bones. Return the meat to the pot and discard the bone fragments if you have the same configuration when you make this dish. Pour a glug of olive oil in a heavy bottom or enameled pot, and over medium-high heat, add the vegetables. Sauté until tender, about 10 minutes, adding the garlic to the mix a few minutes in. Heat a cast iron skillet on medium-high. Add another good glug of olive oil once the pan is hot, swirl to coat, then add lamb in batches so as not to crowd the pan and brown on all sides, about 5 minutes a side. Add lamb to veggie mixture, pour in stout, and cook until reduced by half, 5 minutes or so. Add stock, tomato paste, Worcestershire sauce, mustard, and herbs, and bring to a boil. Reduce heat to medium-low and simmer until meat is very tender, about 45 minutes. Check, cooking a little longer if needed. Make a paste with flour and a little cold water in a small bowl, mixing until smooth. Add to lamb mixture and stir until incorporated throughout. 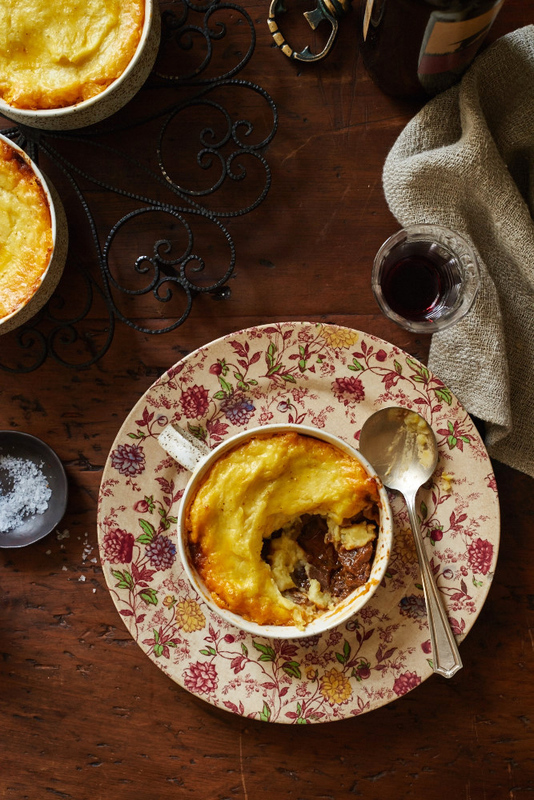 Season with sea salt and freshly cracked pepper and transfer to an ovenproof dish, or four small casseroles, leaving 1/2-inch space from top to allow for potato mash. Set aside. Add cubed butter to the still-warm mash. 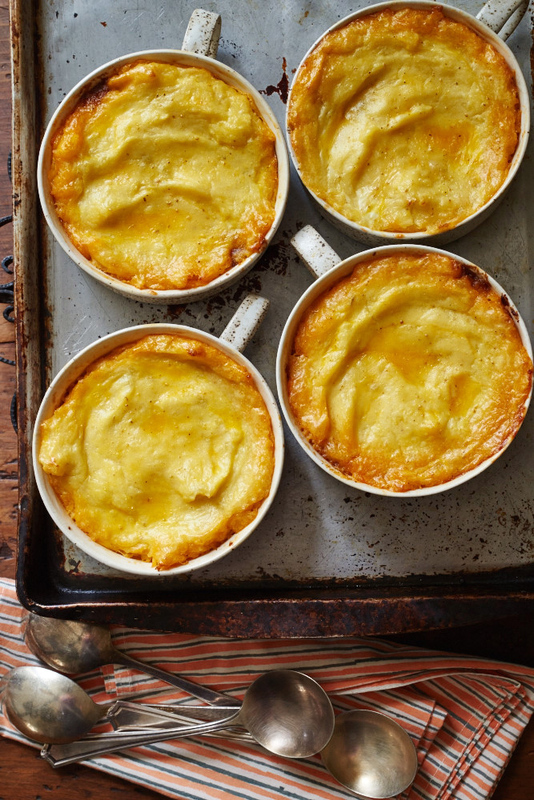 Pour in cream and buttermilk and mash again to thoroughly combine. Add mustard and season with s+p once again, to your taste. Spoon onto lamb mixture, covering entire surface. Brush with egg wash, place onto a baking sheet and bake until golden, about 20 minutes or so. 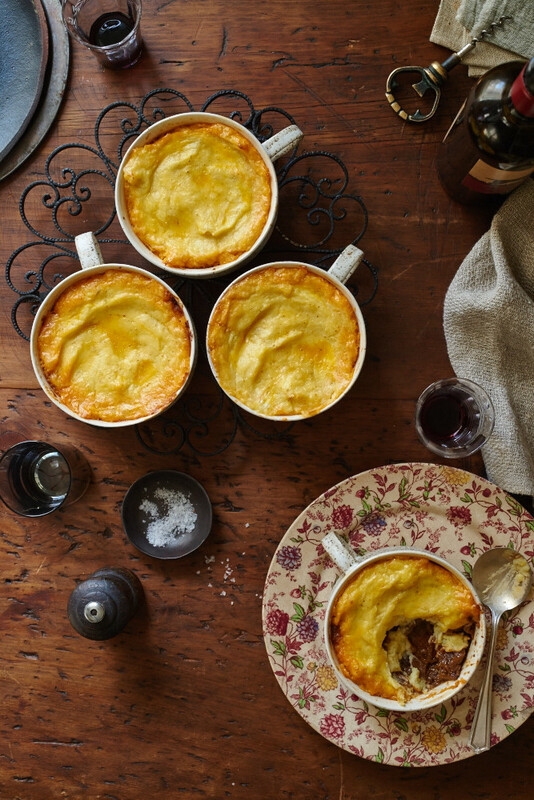 Serve warm, alongside a stout or robust red wine, and good company.